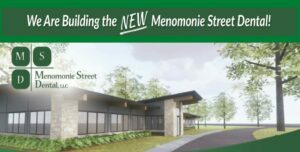 Since 1974, Menomonie Street Dental has been providing the residents of Eau Claire and the Chippewa Valley with the best dental service around. The practice is excited to be entering its next phase of development. Facilities are being upgraded with the goal of creating a state of the art dental office that will increase convenience and accessibility for its patients. The work for this ambitious project has begun and the dental office will remain fully operational throughout the remodel process. Treatment rooms are being designed, all equipment is being upgraded to keep in step with the most advanced dental techniques, and the creation of a new sterilization center will exceed industry standards. The dentists and staff of Menomonie Street Dental are dedicated to providing patients and their families with the highest quality dental care. They can’t wait to show their patients a transformed dental office that has been designed to meet the dental needs of patients and their family for many years to come. The interior/exterior renovation of Menomonie Street Dental is scheduled to be completed December of 2019.